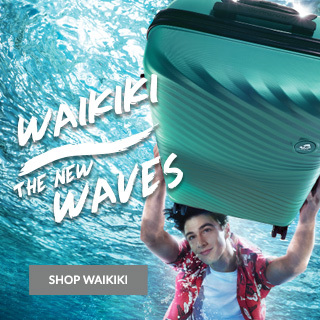 We are delighted to welcome you to the Kamiliant website, the official online store for the brand Kamiliant, where you can browse, select and order products advertised on the website from Samsonite Australia Pty Ltd.
You must be a registered user or guest (“User”) to place orders and access some features of the Website. You will provide us with personal information including your full name, address, a valid email address and a telephone number. You must ensure this information is accurate and current. By using the Website and its associated functionality, and if you opt in to receive email updates from us, you grant your express consent to us to send you direct marketing communications to the email address you provide, from which you may unsubscribe at any time. Your consent to receipt of certain communications may be implied from the use of certain functional aspects of our service, such as receiving reminders that items are in your shopping cart if you leave the page during a transaction. To register an account and/or order from the Website you must be at least 18 years old, have a current Australian residential/business address and have capacity to enter into a legally binding agreement with us. Kamiliant uses its best efforts to keep the information on the Website updated. However, it is not possible to guarantee the complete absence of errors on the Website. The information and other material published on this Website may include inaccuracies or typographical errors. The weights, dimensions and volumes of the products are approximate only. We have made reasonable efforts to ensure that product information is accurate and to display as accurately as possible the colours of our products. However, we cannot guarantee that your screen’s display will accurately reflect the colour of the product on delivery. Changes are periodically made to the information on the Website without notice to you. Kamiliant reserves the right to change the Site at any time, in its discretion. Kamiliant does not warrant that the functions contained in the Website or any materials or content contained therein will be uninterrupted or error free, that defects will be corrected, or that the Website or the server that makes it available is free of viruses or other harmful components. Kamiliant shall not be liable for the use of the Website, including, without limitation, the content and any errors contained therein. You agree to make your own enquiries to verify information provided and to assess the suitability of goods before you order the goods. any bugs, viruses, Trojan horses or other harmful code or communications which may be transmitted to or through our Website by any third party. you access and use the products and services made available at those sites solely at your own risk. Orders placed by you are offers to purchase goods under the terms and conditions in this Agreement at the price specified (including delivery and other charges). Goods in your cart are only reserved for a limited period of time, specified by us. Orders are only confirmed once payment is received in full. You must review your order carefully before placing it. Once an order is confirmed, you are unable to cancel or change it. If you have any problems with your order, then you must go through the normal returns process outlined in this Agreement. In the event that we cancel or are unable to fulfil your order, we will provide a full refund of any payment received. You acknowledge that all orders through the Website are with respect to Goods intended for personal and domestic use only and non-commercial use, and quantity restrictions may apply as set out on the Website from time to time. The price of the product(s) you order is the price that is displayed on the Website at the time you confirm your order and will be confirmed on the e-mail order confirmation. All prices displayed are inclusive of GST. Kamiliant online offers and promotions may only be used at the Website and do not apply to purchases at other online or retail outlets. You may receive online offers and promotions which include a promotional or coupon code (Code) for use when shopping at the Website. It is your responsibility to ensure that the Code is valid, and that you enter the Code at the time of making your purchase online. We cannot apply the Code retrospectively once you have submitted your Order. Terms and conditions will apply to the use of the offer or promotion. Please read these carefully to make sure you can take proper advantage of these offers. Any Code is non-transferable and, unless expressly stated, may not be used in conjunction with any other offers. If your code is lost or stolen it will not be reissued. Any % off stated applies to the Australian recommended retail price (RRP) of items, including the Australian GST component of that price. $50 off sign up promotional code offer valid for online purchases only. Limit of one promo code per person. Code must be redeemed within 30 days of receipt. This code cannot be combined with other discounts or promotions. Subject to this Agreement, we will supply the goods shown on your order confirmation. We will use our best endeavors to meet indicated timeframes for delivery, however we cannot guarantee delivery timeframes will be met. We offer standard delivery free of charge to all residential/business addresses in Australia. We are unable to deliver items to Norfolk or Christmas Islands or overseas or to PO Boxes (including AFPO). We deliver Monday till Friday, except public holidays. Erroneously communicated addresses are the responsibility of the User and may lead to extra charges that will be recovered from the User. We ship our products using Australia Post’s eParcel service. We require someone to sign for delivery. You accept that a delivery is signed for by a person other than the User, provided that such person is present at the delivery address and an adult of 18 years or age or over. If you’re not at home during delivery, Australia Post will leave a card with instructions on how to collect your parcel. This card/notification generally means that your parcel is waiting for you at a local post office. You will need to present this card to the post office when you pick up your parcel, together with photo identification. Please try and arrange pick-up as soon as possible as some post offices will only keep your parcel for a short period of time before they return it to us. We reserve the right to notify you that goods for which you placed orders have become unavailable for reasons beyond our control. You will receive a full refund in the event we cannot fulfil your order. Kamiliant offers an additional commercial warranty on certain products. For details of this warranty, please refer to the warranty card attached to the product and/or to the Website. A return can only be made if products have been purchased on the Website. For returns of products purchased from another retailer, please contact the store of purchase. When seeking to return a product, Users must complete the return form and submit it to our Customer Service team. Where required, we will provide you with a Return Authorisation and instructions on how to return your goods, with which you must comply. Once an item is returned we will either inspect your goods and investigate any claimed defect or, where we believe it is applicable, provide a remedy in relation to your goods. If we do not believe a remedy is applicable (for example, where we believe the goods have been misused or the defect/damage is not covered by the commercial warranty), we will reject your claim and return your goods to you. You must cover the cost of return shipping in order to receive goods we have rejected on inspection, and we will provide you with instructions on how to make this payment. You understand that all information, such as comments, messages, text, files, images, photos, video, sounds and other materials (“content”) posted on, transmitted through or linked from the Website, our Facebook page, Instagram page, Twitter feed, Blog, or forum or other like application or site that allows for the publication of user generated material (“Social Media”), is the sole responsibility of the person from whom such content originated. You understand that we do not control and are not responsible for content made available through the Website or Social Media unless it originates from us. Consequently, by using the Website or our Social Media pages you may be exposed to content provided by third parties that is offensive, indecent, inaccurate, misleading or otherwise objectionable. You use the Website at your own risk and to the extent permissible at law we do not accept liability in this regard. All content, graphics, user and visual interfaces, photographs, trademarks, logos, artwork, and computer code, including but not limited to the design, structure, selection, coordination, expression and arrangement of such material contained or used in the Website is either owned, controlled, or licensed to Kamiliant, or is otherwise subject to the intellectual property rights of third parties and is protected by copyright, patent and trade mark laws and various other intellectual property rights. We reserve all intellectual property rights, including but not limited to, copyright in material and/or services provided or authored by us. Nothing in the Agreement gives you a right to use any of our marketing material, business names, trademarks, logos, images, domain names or other distinctive brand features. If you have any questions, or if you have technical problems in accessing information on our Website, please email customerservice.au@kamiliant.com or call 1800 331 690. A submission will not in any way establish a confidential relationship nor will it place Kamiliant in the position of receiving a submission in trust and Kamiliant shall not be obligated and makes no commitment to treat or maintain as confidential such submissions. Kamiliant shall have the right to retain any material submitted to it, to make copies thereof and to retain the same in its files. No obligation is assumed by Kamiliant or may be implied by the receipt or examination of the submission unless or until a formal written agreement signed by Kamiliant and by you, and then Kamiliant’s obligations shall be only as expressed in that written agreement.